Let’s set up Lucifer’s inevitable annoying drama for the week… honestly I’m really beginning to find Lucifer’s personality quirks more than a little irritating. Every week there seems to be a whole new reason for why he’s going to act super super weird. It’s like iZombie but without the brain eating excuse. Which he doesn’t even remotely pull off, even Chloe calls him out on this (putting it down to fear of losing her) so how he thought he could gool god is something of a mystery. 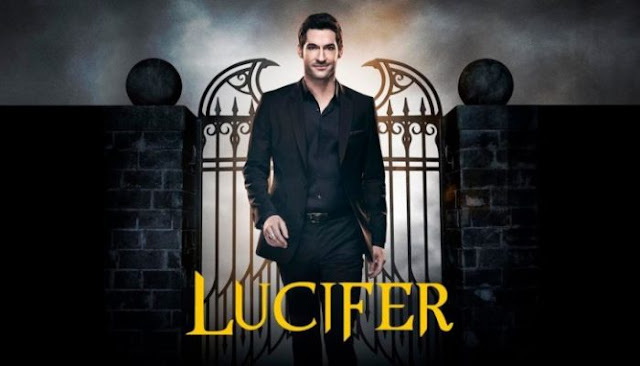 This leads to lots of awkward scenes of Lucifer ostracising Chloe and latching on to every passer by, including bodyguards, extras etc for lots and lots and lots of cringe-worthiness. This happens throughout the case - the murder of a back up dancer who was stepping in for a popular singer, Axara. Naturally everyone assumes the singer is the real target so there follows lots of investigating to see who would want her dead. We have the obligatory red herrings (three of them, including a dubious depiction of a drag queen complete with very coded language) as Chloe and Ella follow the clues with good police work, dismissing these as they track down the actual culprit. But they largely do this without Lucifer since he’s doing the ostracism thing and fawning over everyone else very irritatingly - but he can barely keep it up when Chloe covers Axara with her own body when someone shoots at them. And her passion takes her to his club to sing even though her life is under threat because she’s not giving up or letting anything come between her and what she loves. Lucifer tries to drag her back and they end up singing a lovely hostile duet which is kind of awesome because they can sing. The performance attracts Cece, a woman with a knife, who has been killing people to scare Axara into not performing or touring any more so they can go back to being closest ever friends (or more, there’s an “I love you” in there as well) and she can have her all to herself. Axara excellently reiterates the point about her passion and no-one taking it from her and Lucifer gets himself stabbed trying to protect Chloe. Amenadiel is super happy because he passed his test - he stopped Lucifer and Pierce defying god. To which Pierce points out that Amenadiel still doesn’t have his wings back… but Amenadiel is all hopeful and just full of faith, which is more than a little annoying. But he has hope to offer Pierce - he points to Lucifer willing to take a knife for Chloe and points out even he has faith and hope. I’m not sure how you can compare - Lucifer doesn’t have faith and hope, he loves Chloe. And neither Lucifer nor Amenadiel can really say their experiences are comparable to Pierce’s so their advice or example is… lacking. But then, I’m not sure Pierce’s experiences can constitute hell either. Maze is unmoved and walks out - and Linda is done with her. Maze breaks Linda’s gift (a battle axe). Awwww, i really liked Linda and Maze as friends. He goes to Linda, near tearful, as admits to making a terrible mistake - which seems super melodramatic. So a drag queen portrayed in less than flattering light and an obsessed woman declaring she loves her and being able to murder - so unstable violent lesbian trope also touched upon. You’re not doing any better here Lucifer. I did like Axara, the self-aware diva with bags of talent. I am a little bemused by the tearful Lucifer though… I mean it seems to have come out of nowhere for him to suddenly assume Pierce and she are an item because of one concert? Seems a little extreme… but could it finally lead us to Lucifer and Chloe getting closer and please, please finally telling the big secret.